31.03.2011 - Chekhovskie beat Bosna for the second time, Löwen tie against Zagreb to go on to the next stage. 30.03.2011 - ehfCL.com talks to goalkeeper, Oleg Grams, ahead of the Russian team's return match against Bosna Sarajevo. 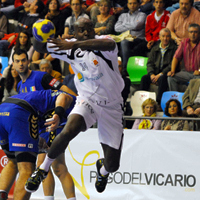 27.03.2011 - Clear Barcelona victory against Veszprem, Ciudad take points from Chambery. Löwen win in Zagreb and “Bears” in Sarajevo. 23.03.2011 - Preview on the first leg matches of the Last 16 in the VELUX EHF Men’s Champions League.